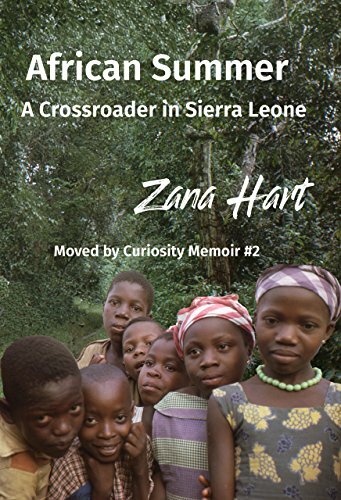 Here are a few selections from African Summer: A Crossroader in Sierra Leone, about my 1963 summer. Why did we go to Africa when we could have had easier lives at home that summer, maybe earning money for college as well? It was early in the sixties, and we all had strong streaks of idealism. JFK was in the White House, and the continual improvement of life for all peoples everywhere seemed possible, even likely, to me. I believe that the other Americans felt that way too. We certainly thought that we could contribute by making this trip. And the lure of adventure was present. The Harford School for Girls in Moyamba went back well over a century. The schoolgirls came from all parts of the country. Since they were still in school, they told us about their homes and lives. They also taught us a few words in Mende. They tried to fix our hair in the West African style of many intricately patterned braids. My head was already aching from the tight rows they had given me. They wore uniforms during school hours, but they could wear whatever they wanted after school, provided it was a skirt or dress. We Crossroader girls had a similar rule, no slacks except on the work project, where jeans or other slacks were the norm. Another evening at the Comfort Bar, I got to talking to a Sierra Leonean man who was an administrator in the government schools. He had studied in England for several years, and there he became convinced that every white person looked down on black people. He did not know what to think of Crossroaders. “When I heard of your group, I thought you must be a propaganda team sent by the American government,” he said to me. I was shocked and tried to assure him that we weren’t. I started telling him about the picket lines I had been on the previous year in Washington, D.C., demonstrating against an apartment complex that wasn’t integrated despite the laws. I got quite indignant as I talked. He passed me his beer. “Here, have some,” he offered. I didn’t much like beer and I had a moment of concern about germs but I took a small swig, handed it back, and went on about how that apartment complex was deliberately breaking the law. I was practically ranting. He just smiled. I saw him at the Comfort Bar a few other times, and I made a point of introducing him to other Crossroaders and getting conversations going. As he got to know us better, he insisted that even if we did not dislike people with dark skin, we were very unusual. He told me that his offering me the beer had been a test. He didn’t expect that I would drink from a bottle an African had been drinking from. I decided this wasn’t the moment to admit to my concern about germs. I tried to deny that, but what did I know? More than anything, what I noticed about the Africans I met was how joyous they were. Sure, nobody was a saint and I saw their ups and downs just as we Americans had ours. But the overall tone of warmth and friendliness made me feel happy to be around them. Given that their economic situation was generally far more basic than ours, to the point of considerable poverty for some, I was surprised by their joyousness. Was it culture, was it religion? I mulled over these questions.